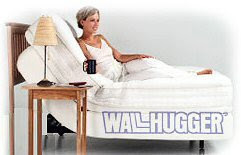 Naturally, our blog is mostly about promoting products from our website www.phc-online.com, but this Wallhugger Adjustable Bed is worth knowing about regardless of your physical condition or age. It's called the Elite Adjustable Bed and it's all your ever need or want for your nightly relaxation center. Just select the bed size and mattress type to receive it in about 14 days. The Elite's wireless remote will let you find the sweet spot in a hurry. Tired of that position? It's as easy as changing TV channels. Simply rearrange yourself by pushing a button. You can even pre-program positions. Even with the standard mattress the Elite Adjustable Bed provides superior comfort over traditional beds. Deluxe mattress types including Pillow-Top and Memory-Foam are available. Rest improvements noticed on first night! Although both foot and head of bed are adjustable, the ability to simply raise your head and upper body is a fast cure for many conditions including snoring. Breathing improvements are quickly realized. Improve blood flow to the lower body by raising the legs and feet. The Elite has Dual-Massage built into each bed. Dual-Massage allows you to control 2 independent zones, your upper-body and lower-body. You control the massage intensity and motion. If you fall asleep it will turn off in about 30 miutes. The Elite is available in Twin, Full, Queen and Dual-King. A Full-size Elite is only $1504.00 delivered with standard tight-top mattress.